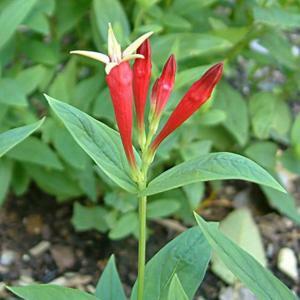 Clump forming perennial with erect stems and pointed lance-shaped leaves. Slender tubular, upward-facing, scarlet-red flowers, opening up at the mouth to reveal the contrasting yellow interiors. A good selected form, otherwise similar to the species. Moist, fertile humus rich soil, preferably in part shade. From seed, although the offspring may be variable, or by division. Also from cuttings, but difficult to root and have low success rate. The root has been used medicinally by the native North American indians.